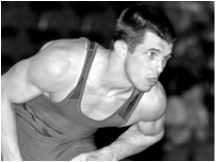 Drew Headlee was a 2005 NCAA All-American for the University of Pittsburgh and a 2x EWL Champion. During his college career he was a 3x NCAA Qualifier and a Four year letterwinner. Before college, Headlee attended Waynesburg Central High School where he compiled a record of 137-28. He was a 2x state place winner and a PIAA State Champion in 2002. Headlee's freestyle career started as a 4x place winner at the Cadet/Junior Nationals and a University National Champion. After college he continued his career by taking a bronze medal at the Cero Pellado tournament in Havana, Cuba and competed in the 2008 and 2012 Olympic Trials.